Assuming a 100 foot deep well with the static water level at 50 feet. Your quote would be customized to your own well’s specs. To pump into your pressure tank or uphill. – Purchase: $399. For ongoing monitoring of water level. – One-time rental: $100. For initial water level measurement to get quote. What are you getting for your investment dollar? You most certainly can find cheaper hand operated pumps being sold by many different vendors. But they all have limited capabilities and can’t pump water from very deep. Plus your only choice is to pump water into a bucket rather than pump water into your home’s pressure tank, and from there to your home’s taps and toilets. Worst of all, most if not all of the cheaper pump’s parts will be made of plastic! 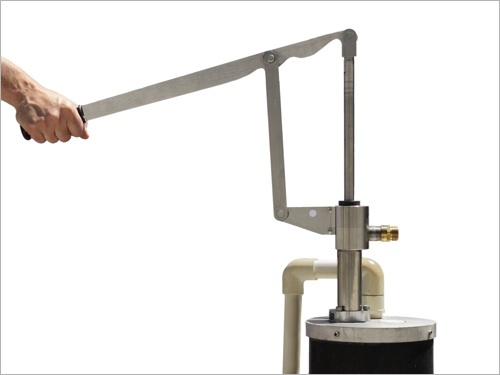 There are a few manufacturers who produce hand operated pumps we would consider ‘comparable‘, meaning they are constructed with higher quality materials and will pump from deeper depths. While they are more substantially made than the cheaper mass market pumps, most are still limited to pumping into a bucket or non-pressure tank. And they are all 25-50% more expensive than Simple Pump! We are confident if you do a detailed comparison, you’ll find no other hand operated pump comes close to the combination of QUALITY PLUS ECONOMY Simple Pump™ offers you.